"The great writers have always been great readers, but that does not mean that they read all the books that, in their day, were listed as the indispensable ones In many cases, they read fewer books than are now required in most of our colleges, but what they did read, they read well. Because they had mastered these books, they became peers with their authors. They were entitled to become authorities in their own right. In the natural course of events, a good student frequently becomes a teacher, and so, too, a good reader becomes an author." 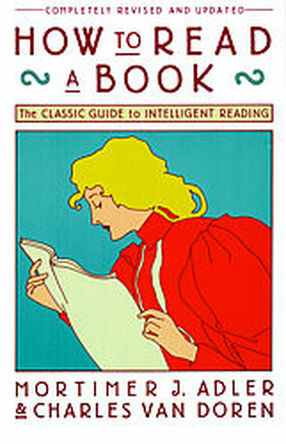 At a glimpse, a book such as this may seem dull, insipid, and hence uninspiring. These were my first impressions, and made me be unmotivated when it came to this particular reading material. This was unfortunate, simply since this book is the one I needed in order to change my twisted and depraved perception of reading; a perception imposed on my by the erroneous applications of reading during High School and even partially my semester at political science on this very university (U.F.M.). Now, I value and understand reading, and like so I also cherish its magnificent provisions of knowledge. I thank this book, along with The Trivium, marking them as perhaps the most significant on my personal behalf during this first semester of the program.